For days, I have been craving for pasta... Oh how happy I was when our trusty helper prepared a huge serving of the good ol' spaghetti for me to bring to the office one day. Pasta ranks definitely as one of my top comfort food. This is together with Sentro 1771's Corned Beef Sinigang and Cibo's Potato Chips. 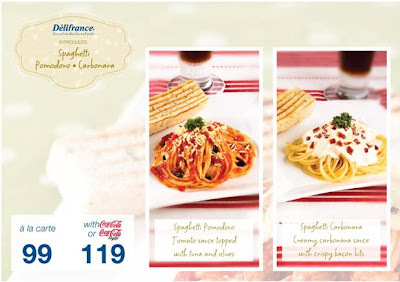 I haven't had lunch yet and I'm starting to feel my stomach growling... what better timing that to receive an email from Delifrance announcing that they have two new additions to their pasta line up.